On January 17, 1871, Paris was besieged—two-thirds of the country was in the power of the Germans. The battle of Le Mans had laid Mayenne and Brittany open to the invaders. In this time of direst trouble, prayer was rising from different parts of France as from one heart and from one voice, most earnestly near that spot where the invader’s next attack was expected. This spot was Laval, chief town of Mayenne. Then it was that Pontmain, a hamlet of some five hundred inhabitants, was to become for ever memorable, because of the heavenly favor vouchsaved that night. Even its geographical position on the borderland between Brittany and Mayenne was to assume historical importance. Seen by the light of the celestial drama about to be enacted above it, it was to appear as a sentinel guarding Brittany. The four children were Joseph Barbedette and his brother Eugene, Francoise Richer, and Jeanne-Marie Lebrosse. Augustine Mouton, a third little girl, saw nothing. The little boys had been in the barn with their father breaking up furze for the cattle. “Pray, my children; God will soon answer your prayers,” was the message of the Blessed Virgin, conveyed in words of gold on a band of glowing white light. This sudden and inexplicable stopping of the German forces in sight of Laval, and their equally inexplicable retirement the following morning, meant, together with the saving of Brittany, the turning back of the tide of conquering soldiery from that part of France. The war was practically at an end. Twelve days later the armistice was signed at Versailles. 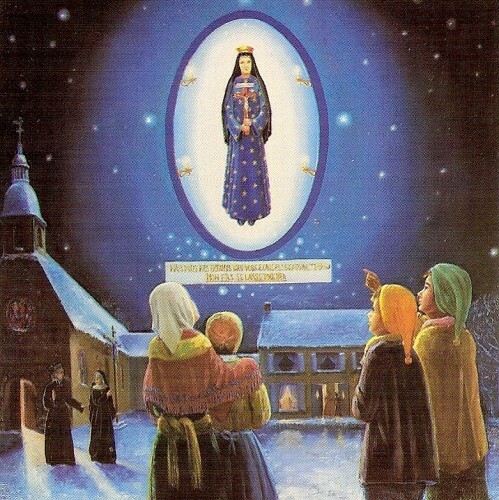 After that the devotion to the Blessed Virgin under the title of that of Notre Dame d’Esperance de Pontmain, Our Lady of Hope of Pontmain, was authorized by the ecclesiastical authorities, and the confraternity of that name has been extended all over the world. Signal favors, both spiritual and temporal, have been granted by heaven through it. What message, indeed, can be more consoling to hearts in the midst of hardship and tribulation everywhere, than the tender promise of the Blessed Mother, “Pray, my children; God will soon answer your prayers”? Throughout the night and early morning today, our little city has been blanketed with snow, the temperature dropping to well below freezing. The coldest night and day of the year. It is cold, but it is beautiful. Notre Dame d’Esperance de Pontmain, dearest Mother, I hear you again. Thank you, my life, my sweetness, and my hope. Thank you for “All Things Marian”. Thank you, Jesus, Child of Mary, for giving us such a good and tender Mother, full of grace. For the children you have given to me, Holy Mother, who have your name forever with them, I will do as you command. And please, dear Lady, obtain for me an increase in Faith, Hope, and Charity, that these theological virtues may bear the fruits of His peace, gentleness, purity, and humility. Notre Dame d’Esperance de Pontmain, priez pour nous pauvres pecheurs. It is cold, and I am weary, but you, dearest Mother, give warmth to my soul. My life, my sweetness, and my hope. May it be given to my children, too, dearest Mother, now and forever.